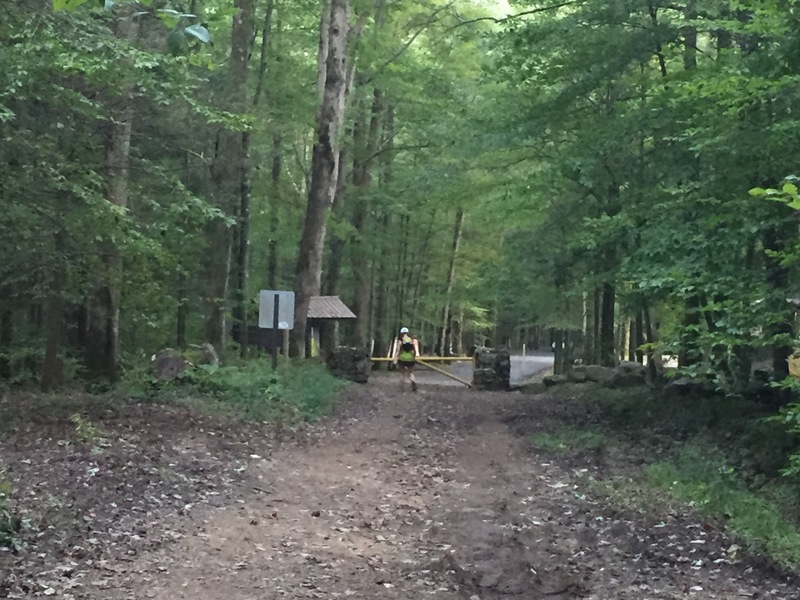 My third attempt to finish the Barkley Fall Classic 50K appeared charmed following packet pickup Friday night. The course route was front-loaded, opening with a beeline run to the two major challenges, T.S. and Rat Jaw, getting them out of the way before the temperatures reached an expected high in the low 80s. The rest of the course is largely under forest cover, so I would be in shade most of the day. Determined to make this trip to Tennessee count, I had actually performed some modest training. 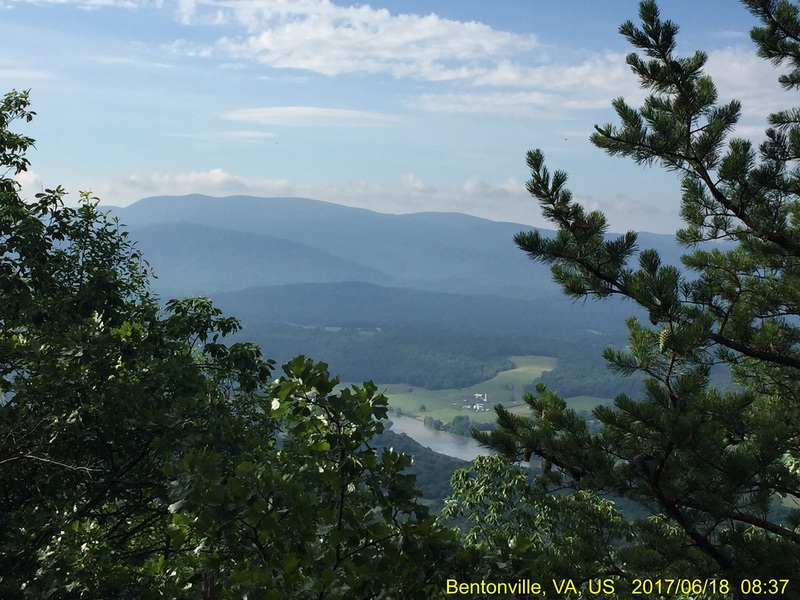 Most fitting was a June morning of “monster hill repeats” in Shenandoah River State Park arranged by Ray. These diagonal drills were good practice for the terrain in Frozen Head State Park. To build some mental muscle, in July and August I did two long, boring runs on the mostly-flat bike trail near home, covering 21.5 and 23 miles. The second outing became a long walk in the second half, as I forgot to bring S-Cap electrolyte tablets and wilted under the sun. Biking to work and regular walks completed my defensive measures against that great enemy, the couch. August also provided the inspiring vision of the total solar eclipse, which I viewed just 14 miles from Frozen Head, suggesting that 2017 might be the year in which I could check off two big goals. We lined up in the Saturday morning gloom under a waning crescent moon, the end of the synodic month that had begun with the eclipse. Race Director Laz lit the starting cigarette at 7 a.m. sharp and we were off. 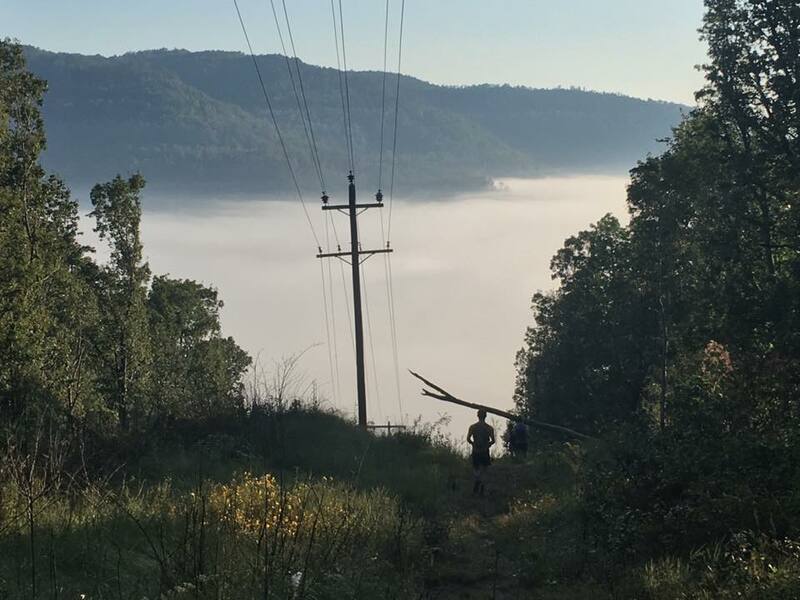 Leonard, the Barkley veteran and reliable finisher, was already hiking and expressed some optimism about the day’s course, saying that we needed to get to the lookout tower by noon to “have a fighting chance” at a finish. Old Mac Mountain was a gentle giant, offering a pleasant warmup as the sun broke through the trees. 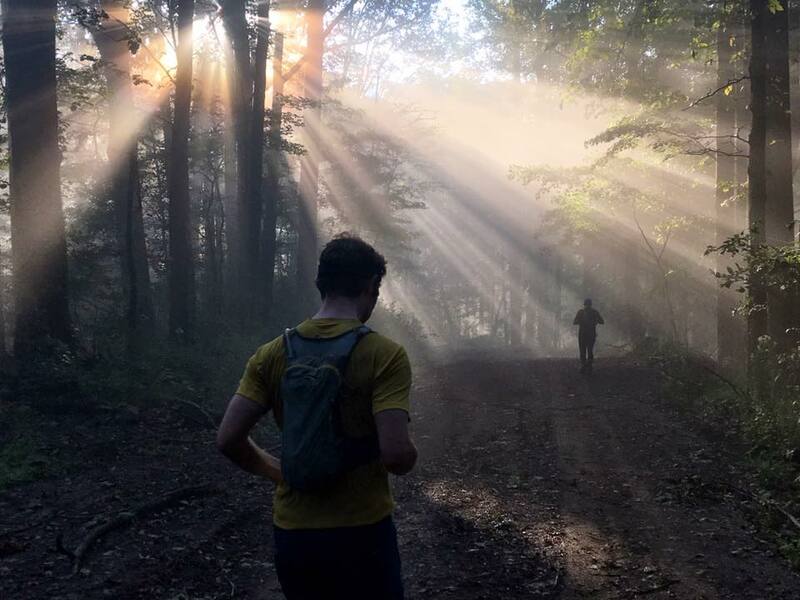 We cruised through the first aid station with water packs still full, then dropped into the first signature challenge of the course, shrouded in a cool mist. Recent rains made the near-vertical buttslides smooth and slick, and I recall hearing the sound of laughter as we descended the steep incline. On two occasions I had to shout an embarrassing “No brakes! Sorry!” as I rear-ended another entrant, unable to resist gravity. Farther down into the fog the going got muddier, and it was soon clear that this would not be a dry feet day. The Appalachians are home to a number of “Mystery Spots“— tourist traps where magnetism has no effect or water runs uphill. I discovered that Frozen Head has its own mysteries. As we descended toward the Salvation Road bib punch, we found ourselves mucking through a diagonal bog, where the water refused to seek its own level. Standing pools of runny mud sucked at shoes all the way to the bottom, where a stream crossing completed the formula for blisters. The shade and mist also seemed to reduce the power of gravity over us. What I remembered in previous years as an ordeal, under the hot afternoon sun, wasn’t so bad in the morning. Climbing back out, we also enjoyed an unexpected treat: a therapy dog. The hound, wearing a hunting collar, easily kept pace with us quadruped humans as we grabbed at weeds and roots to clamber back out of the valley. I wanted to share my water with him, but he seemed fine, so I just gave him some ear scratches. Once at the top, it was time to descend Meth Lab Hill via a steep and rocky gully that is usually brutal. But the sun was still low enough that it was shaded, and I found the going sufficiently easy to be annoyed at the occasional queues at the top of bottlenecks. I was also motivated to get some ice at the aid station outside the prison, and was soon pleased to see the crenelated fortress of Brushy Mountain. The magical cooler of restoration was visible behind the AS table, so I requested a scoop in my water bag. I gathered up a few precious cubes that spilled on the table with my dirty fingers, eating one and putting the rest in the paper hotel cup I carried, then added half a can of Coca-Cola Red, a sugary indulgence that delivered as much pleasure as anyone ever got from the Marlboro Man. Leonard had said he wanted to be at the prison by 10:45. Recalling how he passed me on Rat Jaw last year, I hoped to arrive sooner, but did not enter the front door until 10:47. I wasted no time getting through the dark corridors, then out the back, through the yard, and over the wall for another bib punch, then through the tunnel to get to the bottom of Big Rat. I had gloves ready, but every time I faced an obstacle I thought I would give it a try barehanded first and put the gloves on if needed. I never did put them on, and my hands ended up in better shape than my forearms, which were far better off than my legs. Rat Jaw also turned out to be unexpectedly non-lethal. The saw briars were grown up, but there was a clear path through them. The only difficulty was the slope, and the regular sight of yellow jackets flying around, reminding me of the stings that ruined my day last year. I made it halfway up before one gave me a kiss on the cheek as I crawled along. I blurted out the first word that came to mind, and the person just ahead called back “You all right?” “Just got hit by a yellow jacket,” I answered. With nothing else to do, we kept climbing until I found a little clearing and sat down for the first time. It was 11:30 and I had taken an S-Cap at 9:30 and 10:30, so I washed another one down along with two of the Benadryl tablets I brought. I would look like a chipmunk carrying a walnut the next day, but otherwise the bees did not affect me. But the tower seemed out of reach. I felt sure I would need two hours to climb up from the prison. I picked out a telephone pole a little ahead as a goal and optimistically decided to see if I could reach it in five minutes. My progress seemed too slow to have hope, but I forgot how much time dilates when you feel every second, and I made the target in four minutes. I continued one telephone pole at a time and made good progress, still in the shade. The tower first came into view at 11:56, and I reached it just past noon. No guarantee of success, just Leonard’s “fighting chance” of a finish, but I had completed the two big obstacles already and just had to make similar time to previous years to get past Laz at the marathon cutoff (9.5 hours) and go for the 50K finish (with a comfortable 13 hour 20 minute limit). The first sign of trouble was a clot of runners stopped at a fork in the road, staring at their maps. The road continued straight ahead, and the left turn went up a rise to the left. There was a branch on the ground that seemed to be blocking off this turn. I had not noticed the park trails on the left side that were marked on the map but not part of the course, nor did I know if the course should go up, down, or stay level when we reached the correct left turn. I did not even have a good idea of how far along to expect the turn. Some of this intel might have convinced me to make the turn, despite the absence of any course marker and the suggestive branch. The group continued straight, and soon hit more intersections without markers requiring more map checks, compass reads, and, well, guesswork. As Laz would put it later, “We want to correct our error going forward.” There was indeed an aversion to backtracking, but mainly we didn’t know if we were off course yet. Until we met a runner coming back toward us, saying the trail ahead ended at a lake. There were no lakes visible anywhere on the course map. We turned around, then made a different choice at one of the Choose Your Own Misadventure points. We were encouraged to see footprints of at least half a dozen runners’ footprints in the muddy bogs we splashed through or tiptoed around. Eventually we encountered at least half a dozen runners stopped on the trail ahead, despondently looking at their maps. It was over. I didn’t make a note of the time that we left the last known correct position, but it took 45 minutes to get back to it and take the correct turn. “These things happen,” a philosophical runner said, and I thought there was another word for these things. By the time we got to the Garden Spot checkpoint, the bib puncher made a show of looking at his watch and asking where we had been. With no motivation to run, it was a long hike to the Bald Knob aid station. The philosopher and I discussed taking a jeep road back to the finish, a quitter’s road that would save time but result in a DQ/DNF. Following the course back would add several miles and (I realized later) a lot of elevation change, but it seemed that we would have plenty of time for a drop-down marathon finish. I thought I would probably get lost on the jeep road anyway, so we got back on the course. He ran on; I ran for half a minute but couldn’t motivate myself to keep it up. It would be a long hike out, my fear of being on the trail after dark the main motivation to keep going. At the last checkpoint, I was more than four hours late to try for the 50K. Laz grinned and asked “Looking for this?” holding up a hole punch. I delivered my prepared line about getting a punch in the face. I related my tale of bad nav and wandering in the wilderness, having heard that as many as 60 runners went off course. “It was subtraction by addition,” he said, more to the few spectators still sitting around than to me. Individuals mostly made the turn, he said, but groupthink steered people wrong. I didn’t mention my doubts that a group would have outthunk a sign, figuring this was all part of the Barkley mystique. I took an awkward leave, thinking I would never see Laz again, just like I did last year, and walked off to the finish to get dog tag #3 after something under 13 hours. It wasn’t until I got back home that I noticed how Laz had mispunched my bib to pervert the “Can you beat the rat?” theme. 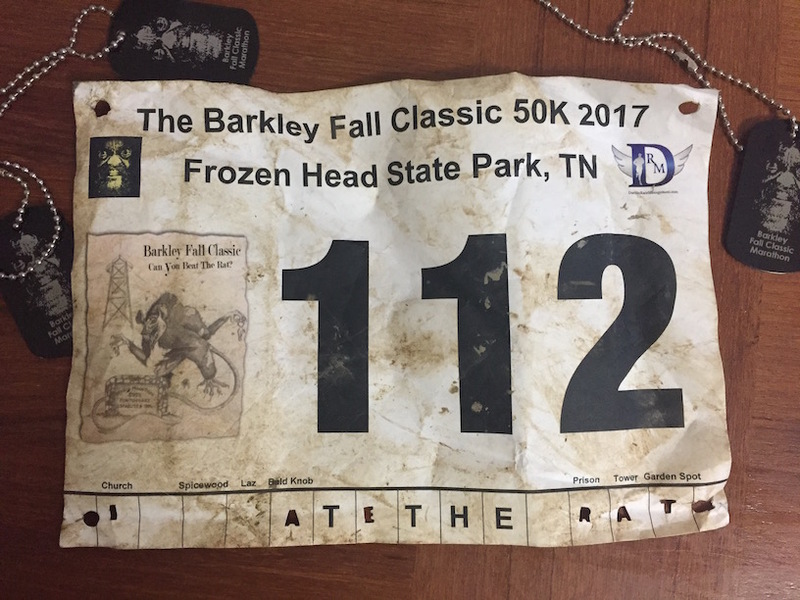 As I prepared this report, the e-mail arrived with a link to registration for the 2018 Barkley Fall Classic. As I did last year at this time, I intend to disregard this announcement. It took until February until I put my name on the waiting list. Then one day in March, while I was on hold with tech support to reset a password so I could do some work I didn’t care about and don’t remember, I got the message saying that a position had opened and I had the opportunity to pay a lot of money to drive a lot of miles to get a T-shirt and maybe another dog tag. I jumped on it. Maybe this year I’ll be stronger. This entry was posted in Race Reports by Steve. Bookmark the permalink. awesome job, regardless of outcome – the journey is the reward – and (P ~ 0.8) you WILL sign up again next year, Sir!